Whisper the name Nepal to anyone with wanderlust and it conjures up images of majestic mountains, spiritual quests and rugged outdoor adventures. And although it’s not a typical destination for package tours, improved transport links and marketing drives mean tourism is gradually increasing — in 2018, Nepal Tourism Board statistics showed that there were 1,173,072 arrivals throughout the year, surpassing the one million mark for the first time. Indian and Chinese visitors made up the lion’s share, but there was also a significant increase in travellers from the US and UK. So if you fancy sightseeing at the top of the world, here are four Nepal Himalayas travel tips. Visiting Hanuman Dhoka is a must when you’re ticking off your Kathmandu to-do list. This impressive royal palace was founded between the fourth and eight centuries AD and the complex was enlarged in the 17th Century. It’s a great place to experience Nepal’s art, history and culture — Kings used to be crowned here, it contains several temples to Hindu deities and the various buildings showcase ancient Nepalese as well as Neoclassical architecture. For a change of pace, flex your vocal chords by heading to the Beta House bar in Kathmandu’s lively Thamel commercial district for the city’s best karaoke every Wednesday evening. You can slake your thirst with local and imported beers, fill your belly with delicious food and belt out your favourite tunes to an appreciative audience. And the fun doesn’t stop with singing — there’s pool and billiards to keep you occupied too. 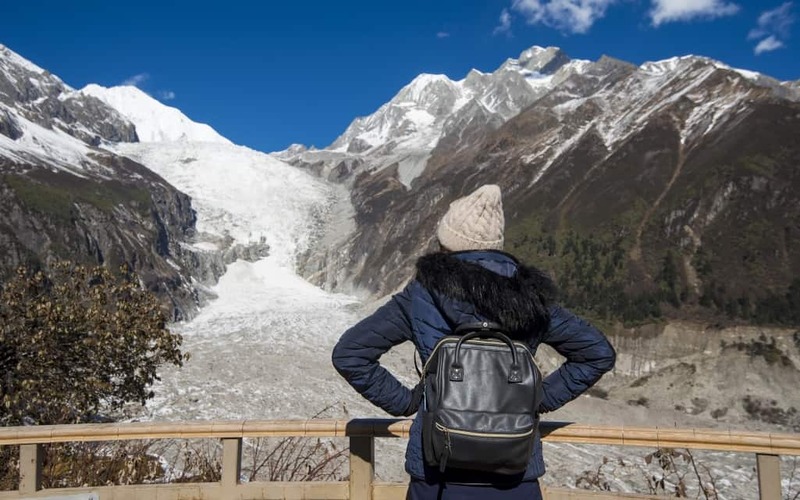 The international border between Nepal and China famously runs across the summit of Mount Everest, so you’d regret leaving the country without experiencing at least a taste of Himalayan life. But if you lack the equipment and experience for climbing, don’t worry — it’s now possible to enjoy seeing the Himalayas aboard a hot air balloon. Baloonnepal.com offer a range of reasonably priced packages, including an eagle-eye flight at sunrise or sunset where you soar over mountains like Dhaulagiri and Hiunchuli, or a magical voyage that takes you 1000 feet high over the Annapurna range and includes an in-flight photo and time lapse video. There are a range of flight options for getting you to Nepal from the UK. If you’re headed to Kathmandu, skyscanner.net currently had flights for between £500-£600 with carriers like British Airways and Qatar Airways, leaving from several UK cities via stopover airports like Doha’s Hamad International. Expect to fly for at least 12 hours, but it’s well worth the wait to experience an amazing part of the planet and take a once in a lifetime trip. And whether you’re departing from London, Manchester or Glasgow, lower stress levels and save some spending money by booking airport parking at Looking4.com — thanks us later. Follow these fab four Nepal Himalayas travel tips and the sky’s the limit. So ends our list! Share your Nepal travel tips in the comments section.